Kathleen Temean gives us a story that is particularly motivating and interesting. All writers should read this one. Click HERE. We all know we have to make readers care about our characters or all is lost. You can find a great post HERE about making your readers care. Anne R. Allen has a not-to-be-missed post HERE that examines the changing role of agents in this digital age. I am adding a new section here. There are so many great books coming out that I hope to get to soon, but don’t know just when I can. But I think these sound interesting enough to mention here. So, for the first book in this section, I’d like to mention A Bird On Water Street by Elizabeth O. Dulemba. This middle-grade book is based on a fascinating (and scary) piece of history and is a cautionary tale everyone should read. This is what Goodreads has to say: A Bird on Water Street is a coming of age story about Jack, a boy growing up in a Southern Appalachian town environmentally devastated by a century of poor copper-mining practices and pollution. Jack is opposed to the mine where so many of his relatives have died, but how can he tell that to his Dad who wants him to follow in the family trade? Jack just wants his dad safe and the land returned to its pre-mining glory with trees, birds, frogs, and nature—like he’s learning about in school. After Jack’s uncle is killed in a mining accident and the Company implements a massive layoff, the union organizes and the miners go on strike. It seems Jack’s wish is coming true. But the cost may be the ruin of his home and everything he loves. Last week I posted an offer to one of you to win a copy of Shane, the best western ever, in my humble opinion. The winner this week is Anne R. Allen! Congratulations, Anne!! Anne is a writer of romantic-comedy/mysteries and blogs about writing. I often link to her blog posts in my Gifts to My Writer Friends section. Coincidentally, I mentioned her posts both last week and this week. Anne is getting a lot of love around here! You can learn more about her (and about writing) by clicking her link above. Anne, I will get your book out to you this week. Yesterday was our regional SCBWI conference and it was TERRIFIC. Great line-up of speakers and workshops. If you missed it, save May 2 for next year. The big thrill for me was a little visit at my critique group table from Melani Grube, who told me she loves my blog and never misses it! WooHoo! Made my day! (Hi, Melani!) I’m one of the volunteers, so I had a loooong day yesterday. This morning I had two airport runs for conference speakers — at 4:00 am and 8:00 am — and then my grandson had a double-header at noon. That said, I am merely going to run a review here I wrote for the San Francisco Book Review. The book is Stained by Cheryl Rainfield, and this is 5-star review I wrote. is finally to begin treatments to erase it, her father’s business has been ruined by an embezzler. They don’t have the money for the treatments. She is devastated. She really believed she could be normal, that the bullying and meanness could be gone from her life. She can barely get through the day, but after school faces the worst bullying incident she’s ever faced. Her best friend turns against her and joins the bullies. When Nick, a really amazing guy who is one of her few friends, offers to walk her home, she kind of blows him off. Brian, a handsome young guy who works for Sarah’s father, offers her a ride home. She refuses, but he drags her into his car and ties her up. Her life becomes hell and makes her earlier problems look like nothing. It will take all her strength and will to survive, and that may not be enough. Cheryl Rainfield has written a dark, edgy, realistic fiction that plumbs the depths of human evil and, at the same time, depicts what really defines heroes. 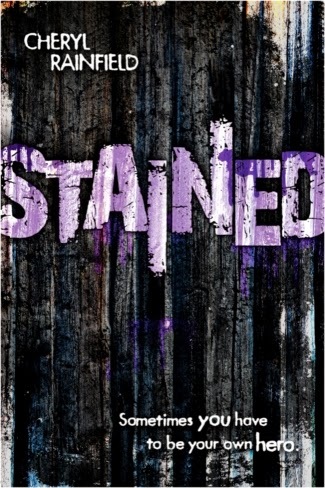 If you would like to win my gently-read hardback of Stained, all you need do is be a subscriber or follower, have a U.S. address, and leave a comment. Please tell me in your comment if you are a subscriber or follower so I can put you in the drawing. I’ll put your name in my proverbial hat. If you want extra chances, post this link on your blog or Facebook or Tweet about the giveaway and tell me that in your comment and you’ll get your name in the hat an extra time. Thanks for reading. I hope to see you here again soon. Please visit Shannon Messenger’s blog (HERE) for more Marvelous Middle-Grade Monday reviews and giveaways.